Barbs are lively, hardy and colorful fish. They are all schooling species that do best if kept in groups of at least five or more, so keep that in mind when considering this family of fish. Most prefer soft acidic to neutral water that is well aerated and a bit on the cooler side. Because they are so active, tank mates should only be species that can tolerate boisterous companions. Long-finned fish, in particular, are usually not the best tank mates for members of the Barb family. These Barb species overviews will help you choose one that is right for you. More detailed profiles are available via the links provided for each species. Similar in shape to the popular Tiger Barb, the male Black Ruby Barb assumes a striking deep red color when reaching breeding age. Peaceful and easy to care for, they should be kept in schools of five or more, and look particularly attractive when kept with barbs having vertical stripes, such as the Tiger Barb. Read the detailed Black-Ruby Barb profile for more information on habitat, care, and breeding. A larger Barb, this species should only be kept with fish of similar size. Because they large and are schooling fish, they are only suitable for larger aquariums. Even if the specimens in the shop are small, keep in mind that the will grow much larger. Read the detailed Denison Barb profile for more information on habitat, care, and breeding. Gold Barbs a hardy community fish that's easy to care for. In nature they are green, but the gold colored hybrid has become so popular that it is usually the only color available for sale. They should be kept in schools of a half dozen or more, and they get along with other peaceful fish. Read the detailed Gold Barb profile for more information on habitat, care, and breeding. 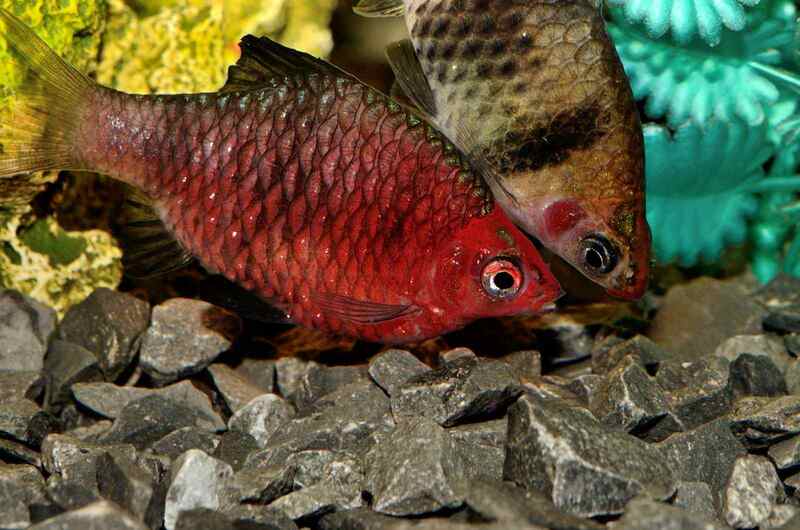 Rosy Barbs are one of the more popular of the larger Barb species. They are very tolerant of water conditions and do well in a newly set up aquarium, making them a popular first fish. They do have a reputation for nipping fins, so don't keep them with slow species, particularly if they have long trailing fins. Read the detailed Rosy Barb profile for more information on habitat, care, and breeding. Easily the most recognizable of the Barb family, Tigers are extremely popular for home aquariums. They also are well known for their tendency to nip fins, particularly those of slower moving fish. For this reason, they are not suited to all community aquariums. They are best kept in large schools with other lively Barb species of similar size. Read the detailed Tiger Barb profile for more information on habitat, care, and breeding. Tinfoil Barbs are the largest member of the Barb family. Unfortunately, they are often only an inch or two long when sold, and many owners have no idea how large they grow. They should only be kept in large tanks of 55 gallons or more with other large species of fish. They make good companions with large cichlids or other large species such as Silver Dollars. An attractive and peaceful member of the Barb family, this species is not as often see for sale. Unlike many members of this family, the Zebra Barb has horizontal stripes rather than vertical stripes, giving rise to the name Zebra. Although they are not extremely large, they are quite active and therefore require a larger aquarium to allow for swimming space. What Catfish Are Good in Freshwater Aquariums?